"I hope you enjoy doing these effects as much as I've enjoyed doing them during my magic life." Here's a man who has known the secret of magic for some time. It's entertainment. And for him, mixing amusement with magic comes naturally. 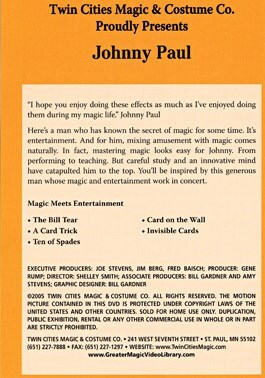 In fact, mastering magic looks easy for Johnny. From performing to teaching. But careful study and an innovative mind have catapulted him to the top. You'll be inspired by this generous man whose magic and entertainment work in concert.